Now shipping as of 3/1/19! Built to handle almost any detailing situation, the LHR 15 Mark III is the ultimate choice for detailing professionals who seek a balance of power and maneuverability. The ergonomic design allows for precise paint correction with complete comfort, including curved surfaces. The powerful motor delivers peak performance in the optimal OPM range and ideal performance through the entire speed range with the addition of a progressive trigger and retuned speed control. Designed as the true “Detailers BigFoot” the LHR15 Mark III polisher balances performance, maneuverability, capability, and the signature ergonomic performance of the RUPES BigFoot family of random orbital polishers. While the orbit of 15mm is smaller than the flagship LHR21 tool by 6mm the LHR15 Mark III compensates with a higher top speed and coupled with the 125mm/5″ backing plate allows the tool to take on more complex or intricate curves and contours found in today’s modern car designs. Improving upon the previous generation LHR15, the LHR15 Mark III adds ergonomic rubber grips for improved operator feel, progressive trigger, a more refined chassis with even better balance, dual tool support rests to keep the polisher upright when on a cart or table, a retuned electronics module for improved performance, and a 30ft cord standard. The MarkIII continues to boast the most efficient design in the category only consuming a max of 500watts of input which means the LHR15 Mark III delivers incredible amounts of torque and power to the surface without any additional vibration, tool generated heat, or other side effects that lead to operator fatigue common with lower quality tools. 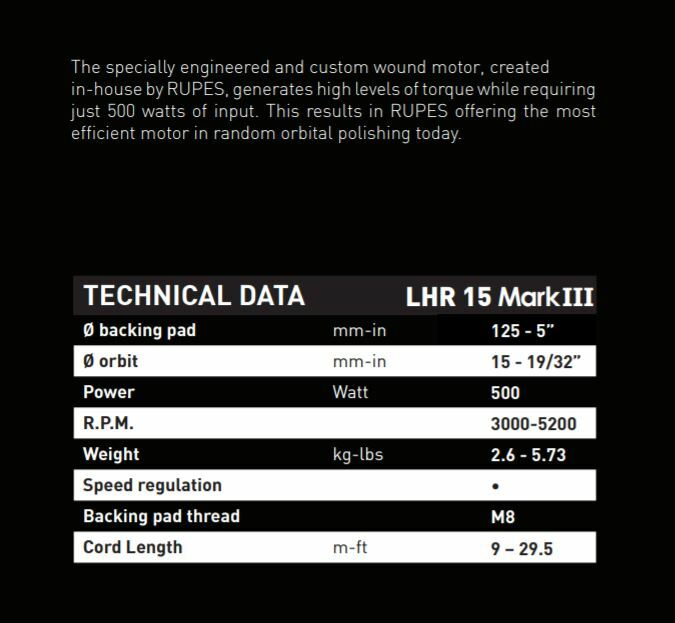 If you’re looking for the best all around random orbital polisher for detailing purposes look no further than the LHR15 Mark III. 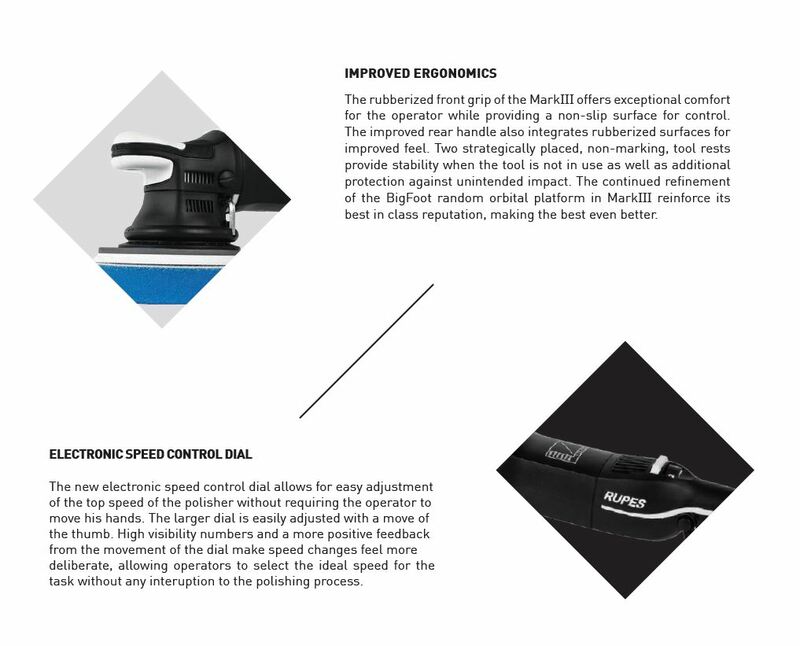 IMPROVED ERGONOMICS - The rubberized front grip of the MarkIII offers exceptional comfort for the operator while providing a non-slip surface for control. 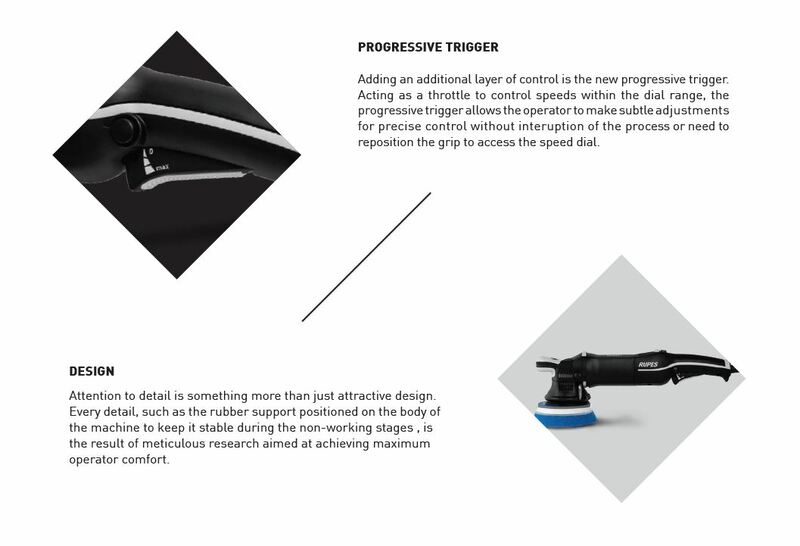 The improved rear handle also integrates rubberized surfaces for improved feel. Two strategically placed, non-marking, tool rests provide stability when the tool is not in use as well as additional protection against unintended impact. The continued refinement of the BigFoot random orbital platform in MarkIII reinforces its best in class reputation, making the best even better.